Walking through a favorite store last week, this sign caught my eye. Sharing my name with a line of filter products hasn’t really affected me much, but there are times – as on this particular day – when my life parallels the life of my inanimate siblings on the shelf. Temporary Price Cut. 15% Off. Brita. I had to giggle as I stopped to capture this photo and I walked away thinking that this explains a LOT! There are certainly days when I am 15% off… Off-kilter. Off-target. Off-my-rocker. 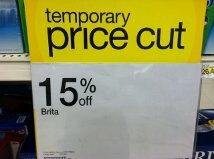 For the bargain price of 15% off, you could possess Brita – an indicator that demand must be lower than supply right now. Isn’t that why products receive temporary price cuts – to generate demand for the stockpiles of product lining warehouse shelves? If so, I have to ask – then what? What happens, once the sale has ended, and everyone wants a piece of me? I suspect you’ve had days like this, where it seems everyone is after you for something. On these days, by the time we collapse into bed for the night, we feel like there must’ve been a sale going on that we weren’t notified about. We feel as if we gave ourselves away to the hungry consumers in our lives. We wonder if we might have been taken advantage of, since we know that we’re worth the full price on our sticker (right?). There’s an innate, defensive reaction to giving our lives away that flows from our personal value perception (like my personal response to this 15% Off sign). I have to admit that my initial reaction to the Brita sign was – Are you serious?! You (not sure who I was talking to) couldn’t even afford me! You can’t put a price tag on Brita! Go ahead and TRY! When I worked for the YMCA years ago, I was very much aware of the organization’s policy to offer its services on a sliding fee scale. The reason for this is simple: they believe that they have a product too valuable to withhold from anyone who needs it, regardless of their ability to pay. God teaches us this same concept, reminding us not to withhold any good thing from others if it is in our power to provide it for them. Pour yourself out for the Kingdom! His Life for Yours – 15% Off – 25% Off – 75% Off – His Gift to You. This is no temporary price reduction – this is grace. Jesus’ gift of salvation is not free, but paid for. This entry was posted in PINK Tuesday and tagged Brita, grace of God, my value to God, personal worth, Religion and Spirituality, YMCA by Pink Shoes Ministries. Bookmark the permalink. Thanks, Mom & Dad! I am grateful for the heritage afforded me and for your support and encouragement. I might FEEL like an inanimate kitchen appliance some days, but I know I’ve been created for so much more than that (actually – we ALL are!)! I raise my glass (of filtered water, of course) to everyone with the guts and vision to look for a better life than this world has to offer, in memory of Grandma Brita!